Thanks for your interest in supporting the Georgia EMS Association through exhibiting and/or sponsoring. 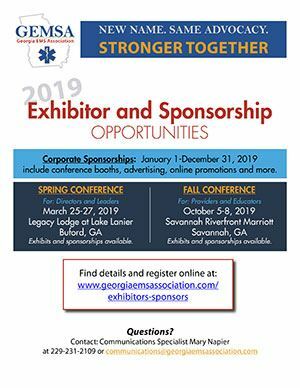 Our exhibitors are what allows us to maintain our registration cost so we can keep the conferences affordable for each EMS professional in the state. It’s our goal to make our exhibitors feel that they’re receiving a benefit for the cost that they’re spending. We sincerely hope you will consider being one of our EMS exhibitors and help us in our goal to improve Emergency Care through education. Download our complete exhibitor and sponsorship guide for complete details on these opportunities or click on the links below. January 1-December 31, 2019 - includes conference booths, advertising, online promotions and more. For those exhibitors who attend multiple GEMSA conferences and events, this option will provide your company with savings and additional benefits. Note: Corporate Sponsorship packages are limited and will be assigned on a first come first serve basis. Corporate Sponsor registration is available until March 1 each year as benefits run January 1-December 31 each year. View complete details here or register using the link below. View complete details here or register using the links below. View more details in our exhibitor and sponsorship guide. More details and registration will be online in April 2019.